In common with almost every form of knowledge, the volume of data describing human disease processes, including their understanding, diagnosis and management, is growing exponentially. The data are increasingly heterogeneous in form, including textual, image and other symbolic structures. They are also hugely diverse in context, from global guidelines based on the broadest epidemiological studies, through knowledge gained from disease-specific scientific studies, both in vitro and in vivo, to individual patient-specific data. The data also spans all length scales, from molecular, through cellular, to tissue, organ and patient representations. In recent years huge breakthroughs have occurred in the description of the human genome and in our understanding of its connection to disease processes through functional genomics studies. The huge volume of this information and its rate of growth represent an unprecedented data management challenge. In particular it is often impossible for an individual, whether a clinician responsible for patient management, or a physicist or engineer developing a new generation of imaging or interventional devices, to understand and assimilate this knowledge. It is increasingly evident that new methods are required to manage, integrate and interrogate the data in a manner that is accessible to the end user. One of the aspects being developed within @neurIST is image-based subject-specific computational fluid dynamics (CFD) of cerebral aneurysms, which is used to understand the role of blood flow in the rupture process. 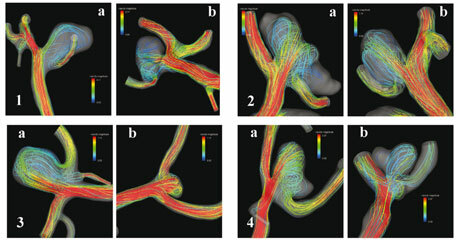 The picture shows CFD simulations (streamlines colour-coding velocity magnitude) in four subjects (1-4) who bear mirror aneurysms in the Circle of Willis (ie aneurysms symmetrically placed in the cerebral circulation). In each subject, the aneurysms are comparable in shape, type and location, and genetic and systemic factors are identical. However, one of them ruptures (a) and the other does not (b). The complex processing chain developed in the context of the project will help in understanding whether flow conditions differ and how they can be used to define surrogates of risk of rupture in a patient-specific manner. Images are courtesy of Dr. A. Radaelli from UPF and were produced in collaboration with NAT/HGC, HCPB and GMU, using ANSYS CFX solver. inspiring and promoting the development of corresponding systems for other disease processes by demonstrating the personal and economic impact of IT-enabled information integration in the context of cerebral aneurysm management. [merging] a top-down approach starting from the models of body parts and organs with a bottom-up approach that models molecular interactions, pathways and cells taking into account existing research activities." We believe that @neurIST is a pragmatic and concrete exemplar of the Virtual Physical Human concept as well as a transitional project from the Sixth to the Seventh Framework Programme. Current understanding of cerebrovascular aneurysm disease combined with modern imaging technology will increasingly reveal silent lesions as found during clinical exams. With a prevalence of 2-3% and a rupture risk in the order of 1/10 000 people annually, treatment of this disease would benefit significantly from an integrated approach and the development of a personalized risk assessment strategy. Integration of multiple clinical data and the use of Grid-based IST systems may provide a platform from which to tackle this problem. This will reduce health care costs by optimally targeting the relevant patient population, thus avoiding unnecessary and potentially risky interventions and improving methods of minimally invasive treatment.